Because spring weather is so unpredictable, you may be unprepared when severe weather hits—particularly if you live in a region that does not often experience thunderstorms, tornadoes or flooding. And when severe weather hits unexpectedly, the risk of injury and death increases. So planning ahead makes sense; prepare for storms, floods, and tornadoes as if you know in advance they are coming because, in the spring, they very likely will. Prepare your family members for the possibility of severe weather. Tell them where to seek appropriate shelter as soon as they are aware of an approaching storm. Practice your emergency plan for every type of severe weather. Show family members where the emergency supplies are stored, and make sure they know how to turn off the water, gas, and electricity in your home. Unfortunately, few of us get much advance notice of a severe weather event. Often by the time we are aware of an approaching storm, we have little if any time to prepare for it. But we do know that when spring arrives, thunderstorms, tornadoes, and floods are real possibilities. So why not take the surprise factor out of severe weather and prepare yourself, your family, and your home? 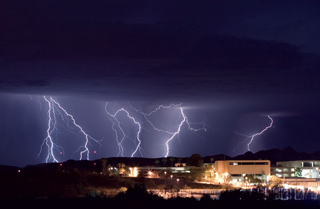 Of course, you may not have to deal with extreme weather this spring, but if thunderstorms, tornadoes, and floods do occur, you’ll be ready for them. The above is an excerpt from the article, “Prepare for Unpredictable Spring Weather.” For more information, please visit www.cdc.gov.